The Vancouver detached market is heading into 2018 on a much different note. December 2017 saw sales drop just 2% on a year over year basis but inventory is on the rise (up 9%) and beginning to put downwards pressure on prices. The average sales price for the year dropped 6.5% as highlighted in my recent Year in Review. Vancouver detached sales saw a small drop of 2% on a year over year basis. 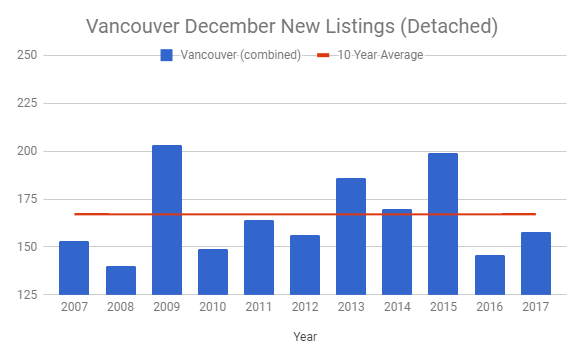 Much of the slowdown is coming from the West side of Vancouver where there were a paltry 37 sales in December, the fewest of any December in the past decade. The East side remains fairly robust, with sales clocking in just below the 10 year average. The 6 month moving averages paint a much clearer direction of sales. Peak sales appear to be a thing of the past. New listings for Vancouver increased by 4% on a year over year basis. As you can see below, new listings are still low and struggling to keep pace with recent 10 year averages. Despite new listings being quite weak inventory levels continue to climb. This is a result of weak sales over the past 18 months which have allowed inventory levels to catch up. On a 6 month moving average detached inventory hasn’t been this high since January, 2013. 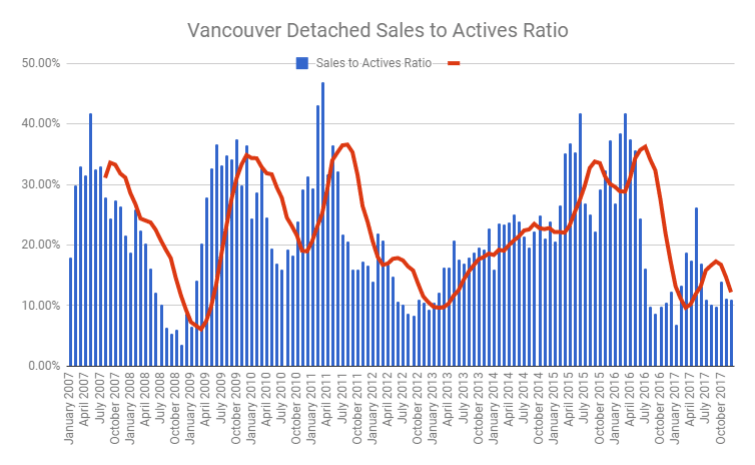 The sales to actives ratio in Vancouver East is considered balanced, while Vancouver West is in what’s considered a buyers market, placing downwards pressure on prices. The average sales price of a Vancouver Detached home was $2,316,006 which is an 11% plunge year over year. Quite the contrary, the median sales price is showing a 2% increase year over year at $1,970,000. For this reason I like to include a 3 month rolling average. It appears 2018 is shaping up to be an important year for the detached market. If sales remain weak and inventory levels continue to rise I suspect we will see further pressure on prices to inch downwards. Further mortgage tightening and a new stress test will hamper borrowing power by as much as 20% which doesn’t bode well for expensive homes. 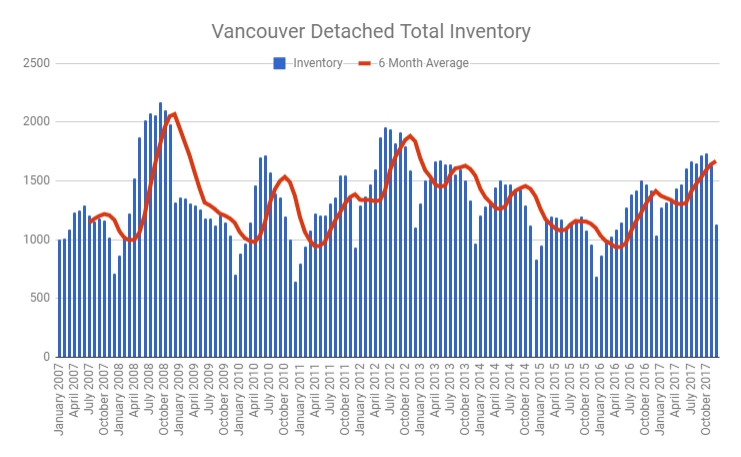 Overall, the concentration of weakness is showing up in more expensive homes while entry level detached homes are still holding up fairly well, as seen in the East side of Vancouver.